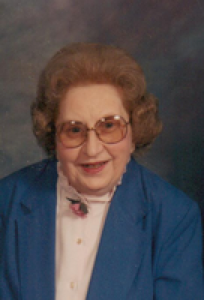 Marie E. (Bishop) Gaier, 94, 1212 Huron Ct., Sidney, Ohio died peacefully in her sleep on Wednesday, October 14, 2009 at 7:01 AM at her residence. She was born January 9, 1915 in Lima, Ohio the daughter of Harry and Mary (Tynan) Bishop. On June 24, 1948 she married her loving, devoted husband Robert and he survives along with daughters, Pamela (Jonathan) Elsass of Milford, Ohio; Carol (Michael) Baez of Bowling Green, Ohio and Judy (Bernard) Mumford of Raleigh, North Carolina and grandchildren, Anne Marie (John) Devlin, Jon (Angela) Elsass, Thomas (Amy) Elsass, Sarah (Leon) Cymbaluk; Ben (Mary) Baez, Nicholas, Alexander, Marcus Baez; Rachel, B. J. (Joslyn), Zachary, Sophie, Maggie, Ellie and Isaac Mumford. Great grandchildren, Max, Suzanna, Lily, Benjamin, Owen Devlin; J. Andrew, Hannah, Jackson Elsass, Whitley, Wyatt, Skyler Elsass; Kayley, Ethan, Kaiden Cymbaluk; Ethan, Wesley Baez. One sister, Helen Jordan is deceased. She was a member of Holy Angels Catholic Church in Sidney and was a member of the Altar Rosary Sodality at the church. She was a long time member of the Wilson Hospital Auxiliary. She was in a card club and loved to play bridge and euchre. She had been a cashier at one time at the Ohio Theatre and Warner Theatre in sidney. A Mass of Christian Burial will be held on Saturday, October 17, 2009 at 10:00 AM at Holy Angels Catholic Church with Rev. Dan Schmitmeyer. Burial will be at Graceland Cemetery, Sidney, Ohio. Friends may call at Salm-McGill and Tangeman Funeral Home on Friday, October 16, 2009 from 5-8 PM. Memorial contributions may be made to Wilson Hospice, 915 W. Michigan St., Sidney, Ohio 45365 or Holy Angels Grade School, Tuition Aid, 324 S. Ohio AVe., Sidney, Ohio 45365.